Pativia’s story tells of how cricket “brought her back from a life of hopelessness” after the death of her mother and how she has gone onto represent the Samoan national side, before more recently coaching her son and daughter to international success. The competition really showed the passion that our finalist nations Samoa, Fiji and Vanautu have for the game – which also be seen in the video put together for the competition by Adam Cassidy, Regional Project Officer at ICC EAP. Flicx would like to thank Adam and all the finalists for their support in promoting the competition to their networks. The Flicx pitch was originally developed to take the game to places where it has not been played before, so it’s a great way to create cricketing venues which can in turn get more people playing the sport particularly in countries where cricket is still developing or the climate makes maintaining a wicket more challenging. As well as match pitches, we have a range of coaching products so for any enquiries from the EAP region please contact Paul at Flicx Australia on paul@flicx.com. Flicx UK launched, to the trade, their new 2G range of portable, roll out cricket pitches at Lord’s- The Home of Cricket. The new 2G material creates a much superior surface on which to play cricket with improved bounce as well as better spin and swing performance on the UK made plastic which is softer and easier to work with when rolling it out. Other developments include additional colours in the product range with customers being able to choose their pitch colours and brand it with sponsors or club logos. In addition the 2G pitches have reduced slip and we have some fantastic new designs including a skills pitch which is great for coaching young players on with markings to help bowling length and consistency. The 3 designs, the 2G Flicx Match Pitch, the 2G Flicx Skills Pitch and the 2G Hawkeye Pitch each come in 6 different lengths with the Skills Pitch also available as a small 4 meter Throwdown. We are sure that the Flicx 2G surface will be very popular with clubs and schools for both matches and practice in the nets. A Flicx Pitch uniquely allows any surface to be transformed into a cricket pitch, taking the game to new markets. Simply roll it out on a flat surface such as astroturf, rubbercrumb or concrete or divide your grass cricket pitch into 4 junior pitches to maximise your space. Your Flicx pitch can either be rolled out each time you use it or installed into the ground for a more permanent surface, which allows the grass to grow through it, making for a great value pitch option for your club. The launch of the new 2G Flicx Pitch at Lords, the Home Of Cricket, takes place exactly 14 years after the Flicx Pitch was initially launched in South Africa. The original Flicx Pitch was designed and made in South Africa – where it was used to assist the development of the game of cricket as the country was evolving out of the Apartheid Era. The 2G Flicx Pitch can be laid on any flat well prepared surface- It can be rolled out before or after each game or it can be left for the season – in which case the grass will grow through it giving a “turf” effect to your new playing surface. We certainly feel that the new 2G Flicx Pitch will extend the market into clubs and schools… especially where old synthetic pitches have lost their shape and performance – The 2G Flicx Pitch can be simply rolled out on top of the surface without the major cost of replacement or resurfacing. The new range now includes the exciting 2G Flicx Eagled-eyed and the 2G Flicx Skills Pitch. Different coloured tiles have been used to identify zones- these can be used by bowlers and batsmen alike to assist in the development of their cricketing skills. Notes to the Editor: The Flicx Pitch is the brainchild of South African entrepreneur Richard Beghin who wanted to help make South Africa a better country to live in, and his passion for his country and his love of cricket led him to develop the Flicx Cricket Pitch. 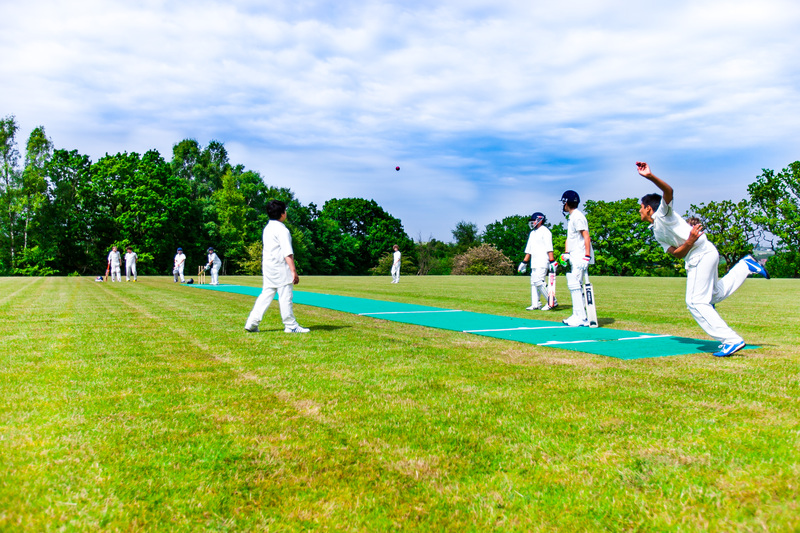 After moving to the UK, Beghin received hundreds of pitch orders to support the growth of grass roots cricket and many clubs and schools have benefited from them since. The new 2G surface is an exciting development for the company and see’s UK manufacturing of the pitch for the first time with new designs and the ability to fully bespoke your pitch with branding and colouring. Design a new Flicx Pitch…COMPETITION!! Are you a cricket coach or a budding designer? If so then Flicx UK have a competition just for you as we are looking for new ideas and designs for the 2014 Flicx range. The Flicx Pitch is a great way for juniors to improve their bowling line and length as well as batting technique as marks on the pitch assist players in becoming more consistent acting as coloured target lines. The image above shows the current traditional Flicx design. It features a Hawk Eye strip through the middle, colour coding for on side and off side created with coloured tiles whilst the two strips behind the stumps are to assist with channel bowling. Now we are looking for YOU to come up with new ideas for a new pitch design which we will then take to a public vote to choose the winning entry. Your design could be for any purpose and made in any colour. For example to with aids to help coach kids, to fund raise for a certain charity or based on a bowler or your own innovate ideas. The winning entry will receive a Flicx mat made in their design (7.5 x 1.6 metres ). All entries which reach the final public vote will also receive runners up prizes.